Each player has a flight of four fighters, represented by two counters. Aircraft counters move by means of curved “performance rulers” that represent the aircraft’s historical cornering ability and maximum speed. 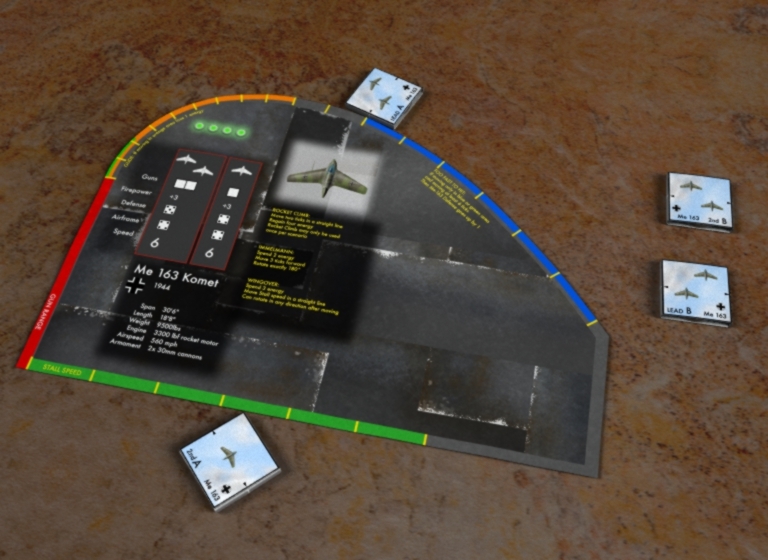 Each performance ruler is unique to each aircraft, and contains all the speed, cornering, and weapon information needed. Each aircraft is sold separately. Only pay for the ones you want, and print out as many copies as you need to create your own epic WWII air battle. Point Defense: Me-163 Komets assisted Fw-190D fighters attacking a formation of B-17G bombers and their P-51D escorts. Red Komet: Returning from a mission with no fuel, a lone Me-163 has to glide past marauding P-51D fighters to return to base. This set contains only the Me-163. Other aircraft referenced in the scenarios are sold separately.